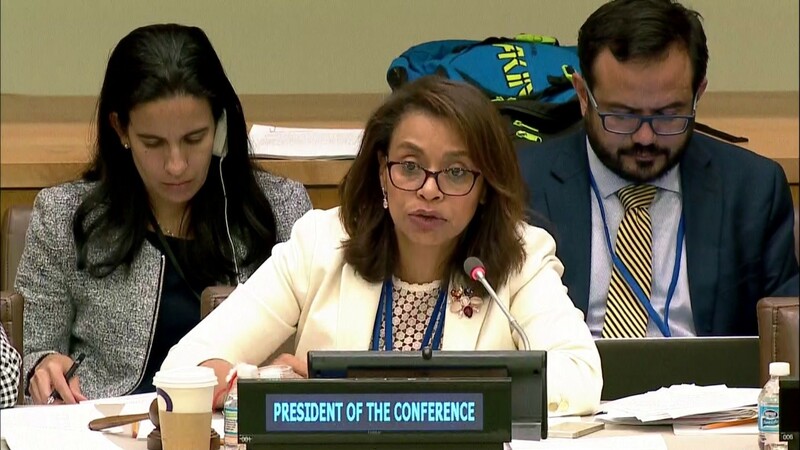 By resolution 71/258, the General Assembly decided to convene in 2017 a United Nations conference to negotiate a legally binding instrument to prohibit nuclear weapons, leading towards their total elimination. The Assembly encouraged all Member States to participate in the Conference, with the participation and contribution of international organizations and civil society representatives. 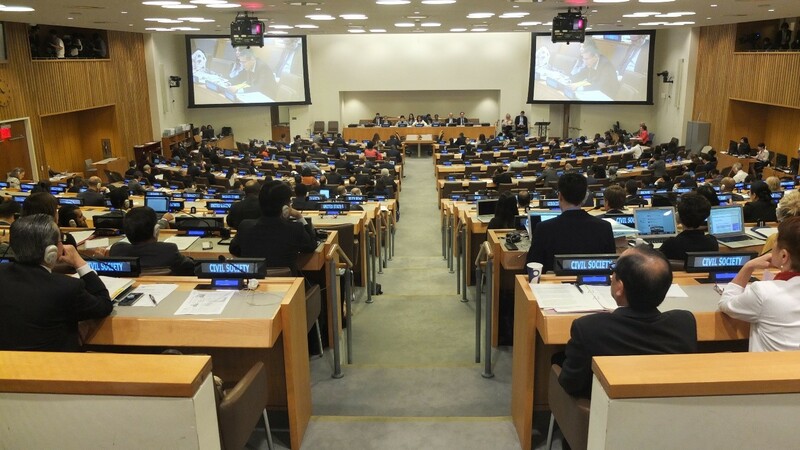 The Conference took place from 27 to 31 March and from 15 June to 7 July in New York. The Conference was chaired by Ambassador Elayne Whyte Gómez, Permanent Representative of Costa Rica to the UN Office at Geneva. The Treaty on the Prohibition of Nuclear Weapons (TPNW) includes a comprehensive set of prohibitions on participating in any nuclear weapon activities. These include undertakings not to develop, test, produce, acquire, possess, stockpile, use or threaten to use nuclear weapons. The Treaty also prohibits the deployment of nuclear weapons on national territory and the provision of assistance to any State in the conduct of prohibited activities. States parties will be obliged to prevent and suppress any activity prohibited under the TPNW undertaken by persons or on territory under its jurisdiction or control. The Treaty also obliges States parties to provide adequate assistance to individuals affected by the use or testing of nuclear weapons, as well as to take necessary and appropriate measure of environmental remediation in areas under its jurisdiction or control contaminated as a result of activities related to the testing or use of nuclear weapons. The Treaty on the Prohibition of Nuclear Weapons was adopted by the Conference (by a vote of 122 States in favour ( with one vote against and one abstention) at the United Nations on 7 July 2017, and opened for signature by the Secretary-General of the United Nations on 20 September 2017. It will enter into force 90 days after the fiftieth instrument of ratification, acceptance, approval or accession has been deposited. 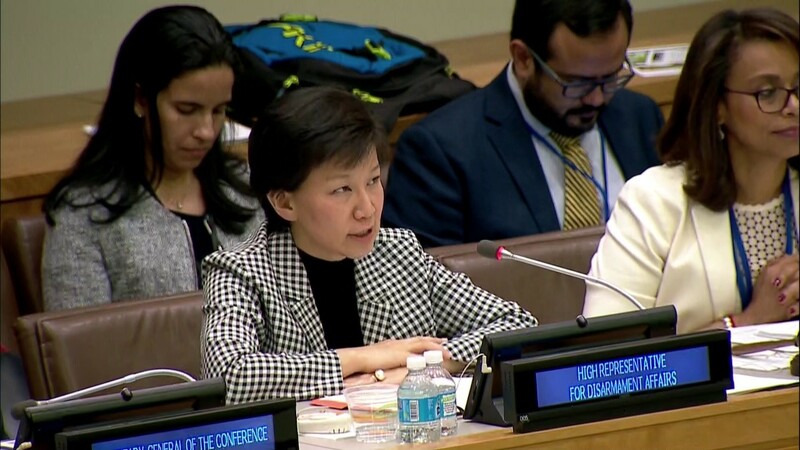 The initiative to seek a legally binding instrument to prohibit nuclear weapons is an outcome of the discourse centred on promoting greater awareness and understanding of the humanitarian consequences that would result from any use of nuclear weapons. In recent years, renewed interest in the humanitarian impact of nuclear weapons was first manifested in the final document (NPT/CONF.2010/50 (Vol. I)) of the 2010 Review Conference of the Parties to the Treaty on the Non-Proliferation of Nuclear Weapons. In its conclusions and recommendations for follow-on actions, the Conference expressed its deep concern at the catastrophic humanitarian consequences of any use of nuclear weapons and reaffirmed the need for all States at all times to comply with applicable international law, including international humanitarian law. In 2012, expressing concern about the catastrophic humanitarian consequences of any use of nuclear weapons, the General Assembly adopted resolution 67/56 entitled “Taking forward multilateral nuclear disarmament negotiations”. By this resolution, the Assembly established in 2013 an open-ended working group to develop proposals to take forward multilateral nuclear disarmament negotiations for the achievement and maintenance of a world without nuclear weapons and the open-ended working group reflected its discussion in its report (A/68/514). A series of three international conferences on the humanitarian impact of nuclear weapons, convened in 2013 and 2014 respectively in Norway, Mexico and Austria, sought to present a facts-based understanding of the short and longer-term effects of a nuclear weapon detonation. These conferences, which included participation by a large majority of States, the International Committee of the Red Cross and hundreds of representatives of non-governmental organizations, principally coordinated by the International Campaign to Abolish Nuclear Weapons (ICAN), played an important role in building demand for urgent action to advance nuclear disarmament negotiations.